Our 4 days in Lisbon were a new experience for us in a few ways: our first time in Portugal, our first stop on the Atlantic coast of Europe (unless you count Tarifa, Spain, which straddles the Mediterranean and the Atlantic), and our first time using a free airline stopover to add a quick detour to our plans before heading off to our intended destination. It was a great success: the stopover process through TAP Air Portugal went off seamlessly, and we loved getting a quick taste of Portugal during our 4 days in Lisbon. Here’s what we got up to during our first trip to Portugal. We went crazy over nata. Our flight from the USA landed in Portugal at around 6:30am local time–and to say the jetlag hit us hard was an understatement. We had a 10:30am tour scheduled and knew we couldn’t allow ourselves to go to sleep, so after dropping our bags off at the hotel, we stumbled into the nearest cafe that looked interesting–and boy, did we get lucky. 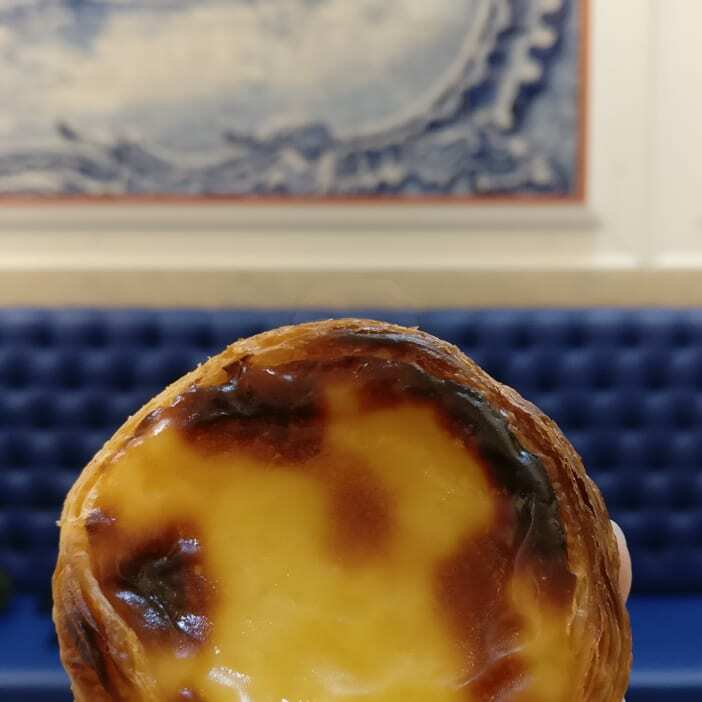 Lisbon is known for, among many other things, its nata pastries, and that’s exactly what we found! Fabrica de Nata specializes in pastel de natas (or simply “natas”), a puff pastry filled with a cream that is typically made of milk, sugar, eggs, vanilla, and cinnamon, and is typically served with coffee. On that first morning in Lisbon, we found the natas tasted best washed down with two espressos each. The Alfama District occupied our attention for hours on a beautiful day. 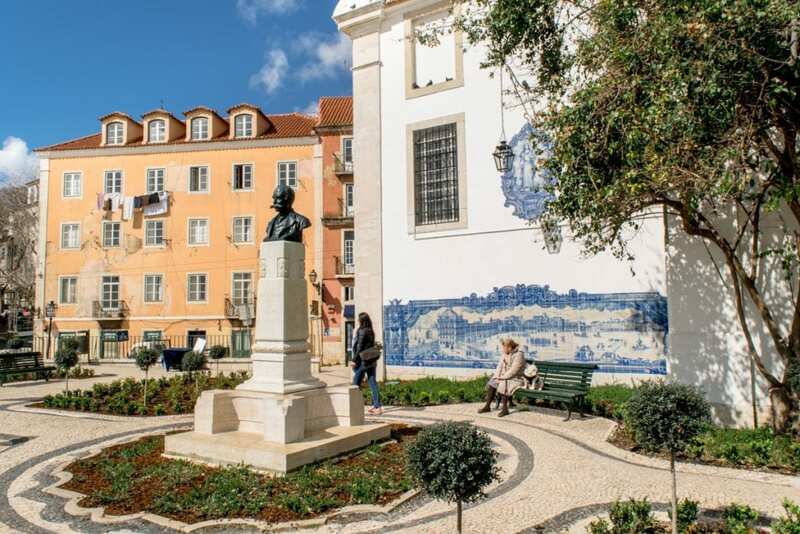 Lisbon’s oldest district is considered one of the best photo spots in Lisbon and is the perfect place to wander around in search of those classic Lisbon views: bright yellow streetcars, tiled buildings, coastal views, and winding roads are in abundance here. We spent an entire afternoon during our 4 days in Lisbon walking aimlessly around Alfama (which–unsurprisingly given that it’s Lisbon–involved climbing lots of hills), ducking into churches, stores, and coffee shops along the way. All of the climbing ended up paying off in a big way: we found two of our favorite views of Lisbon in the Alfama District. The Miradouro de Santa Luzia and the Miradoura de Graca both charmed us completely–under bright sunny skies, the beautiful blue-tiled walls at the Miradouro de Santa Luzia, in particular, were exactly how we had pictured Lisbon when planning our trip there. We saw the sunset over Lisbon from the world’s most perfect vantage point: a sailboat. A glass of wine, some sea breeze, a sunset, and a sailboat–how’s that for the perfect way to end a day? 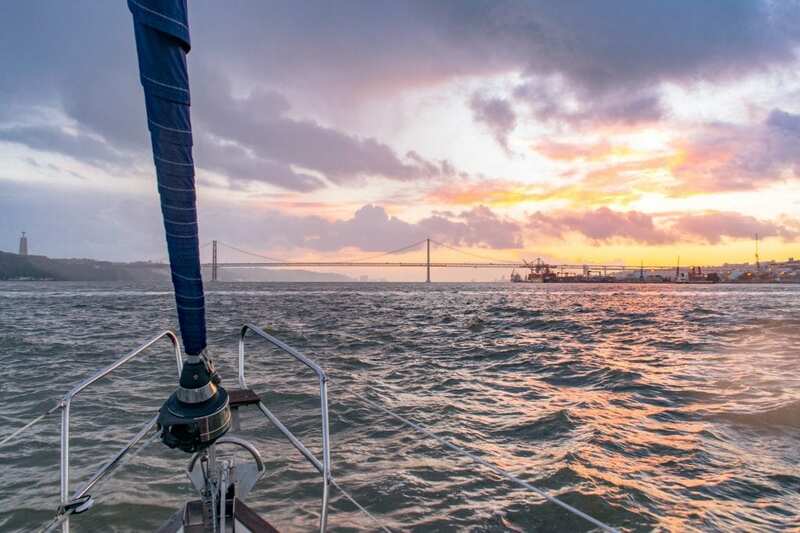 During our 4 days in Lisbon, we partnered with Marlin Tours to experience a beautiful Lisbon sunset from the water, and it was absolutely amazing. Not only did we get to watch the sunset over Lisbon from one of the best vantage points imaginable, we also got to see some of Lisbon’s most famous spots from the water: our tour took us right across Lisbon’s waterfront to the Commerce Square, then back under the red 25 de Abril Bridge (which looks remarkably like the Golden Gate in San Francisco), and to the Belem Tower and the Monument to Discoveries. Our captain was laid back and friendly, regaling us with trivia about Lisbon, answering everyone’s questions along the way, and was happy to let us (carefully) head to the bow of the boat to the some of the best views–Jeremy and I ended up spending at least half the trip up there, as we just couldn’t tear ourselves away. We loved getting to see Lisbon’s landmarks from the water, but even more than that we loved being on the boat itself: it was unbelievably relaxing to sit back with a drink and a view and enjoy the light breeze floating across our faces. The next time we go back to Lisbon, we’ll definitely be hitting the water again. Book your sunset sailboat tour with Marlin Tours! Our continued desire to see as many epic bookstores as possible took us to LX Factory. Unique and interesting bookstores are one of our favorite things to find while traveling, so when we heard about Ler Devagar (translation: “read slowly”), a bookstore housed in a former printing space in the LX Factory, we knew we had to visit. The bookstore itself was just as charming as expected–not only can you peruse hundreds of books there, some of the old printing press equipment is still present upstairs, as is a hobbyist inventor, excited to show off his eclectic inventions. 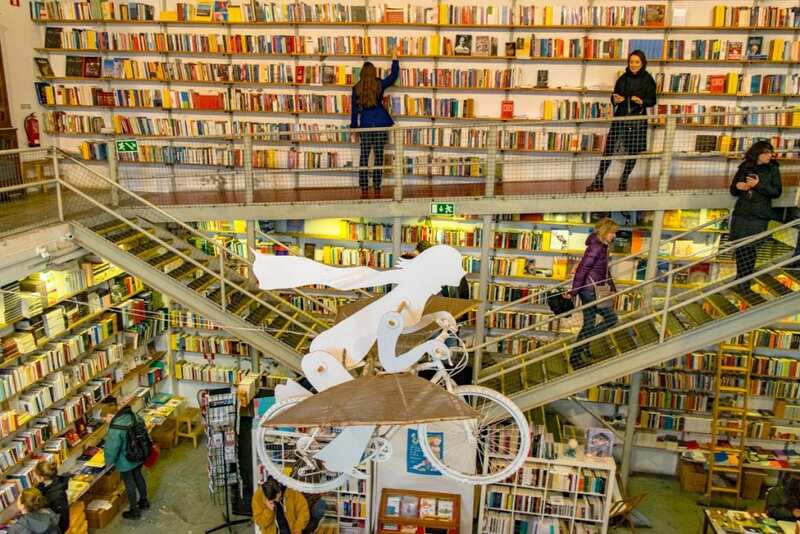 Regardless of whether or not you’re looking to buy a book or two, Ler Devagar is still worth stopping by while in Lisbon… as is LX Factory in general. LX Factory is a revitalized manufacturing space, once forgotten and now a thriving hodgepodge of restaurants, specialty stores, coffee houses, and more. It’s the perfect setting for a bookstore like Ler Devagar, and though we visited on a dreary day, we would love to spend hours exploring the area in the sunshine. Portuguese food is not something we were very familiar with before our 4 days in Lisbon, though we assumed it involved a lot of seafood (spoiler alert: we were right). We loved sampling food throughout the city, starting with our morning spent on a food tour in the Campo de Ourique neighborhood with Taste of Lisboa, sampling everything from green wine (aka young wine) to pork sandwiches to mussels to the world’s best chocolate cake–plus plenty of beer and wine, of course. 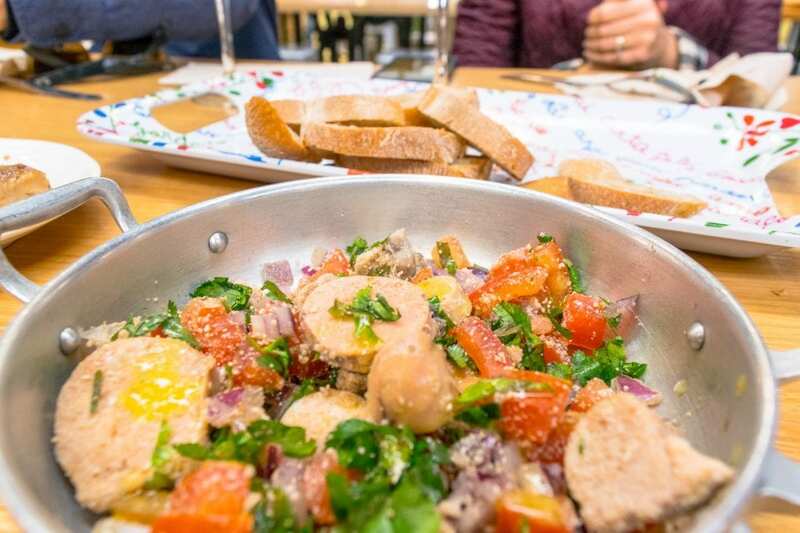 We left the tour with plenty of new foods under our belt and a desire to keep eating Portuguese food for the rest of our time in Lisbon, a challenge that we happily took up. We took a day to visit Sintra. About 30 minutes outside of Lisbon by train sits Sintra, the adorable small town that is famous for its many castles and palaces. 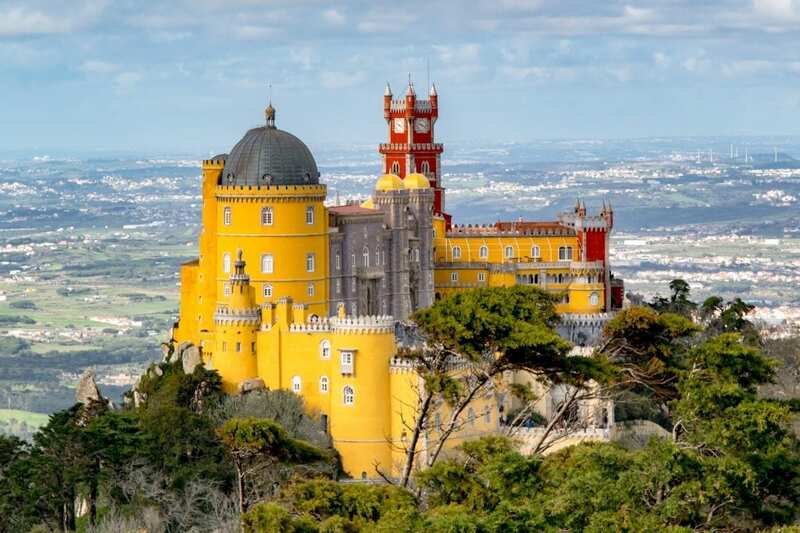 The most famous of these is the iconic Pena Palace–set high on a hill overlooking the Portuguese countryside and painted bright yellow and red, Pena Palace is impossible to miss. We were enamored with this palace, and ended up spending even more time here than we anticipated: while the exterior is remarkable, the interior of the palace and the views from it also deserve some attention–we were blown away by the unique decor and the jaw-dropping views from the windows and balconies. While visiting Pena Palace, don’t forget to walk 20-30 minutes to the Cruz Alta viewpoint to get one of the best views of the palace itself! Quick travel tip if you plan to visit Pena Palace: even on a weekday with iffy weather in shoulder season, we ended up waiting for quite awhile to purchase tickets to get into the park. If we visit again, we’ll purchase a skip-the-line pass and would recommend one to anyone planning to visit! Book your skip-the-line ticket for Pena Palace! 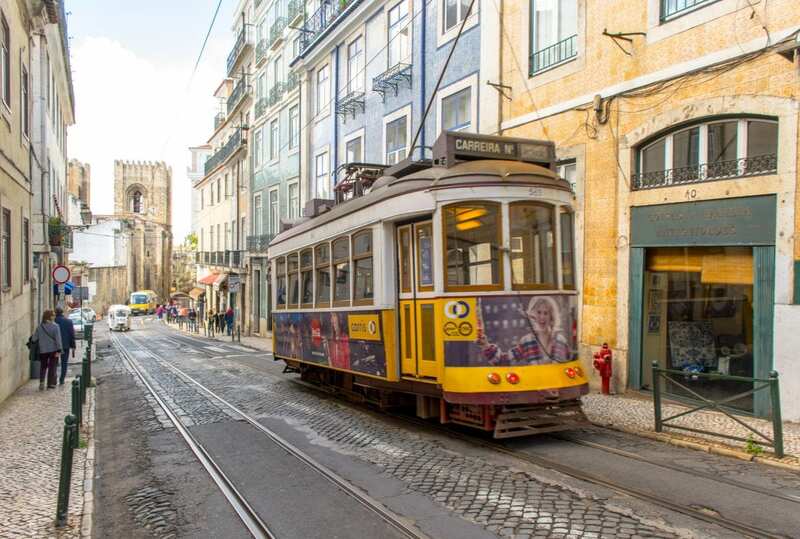 Last but not least, we obsessed over Lisbon’s streetcars & tiled buildings. So much of Lisbon’s city center looks exactly like we imagined it would: tiled buildings, bright colors everywhere, and adorable streetcars whizzing by. Like all cities, not every inch of it is as ideal as a postcard, but wide swaths of Lisbon… pretty much are. During our 4 days in Lisbon, we came to view the entire city as having a vibe that was sort of half-elegant-European-capital-and-half-beach-town–and there aren’t even any beaches directly in town! The laid-back nature of Lisbon, though, paired with its sunny weather and vibrant decor, gave it a casual, relaxed vibe that made us immediately wish for summer to arrive. Our 4 days in Lisbon did exactly what we expected them to: gave us a taste of a city and a country that we would love to return to for a longer stay in the future–preferably during warmer weather when Portugal’s famous beaches will be at their best. 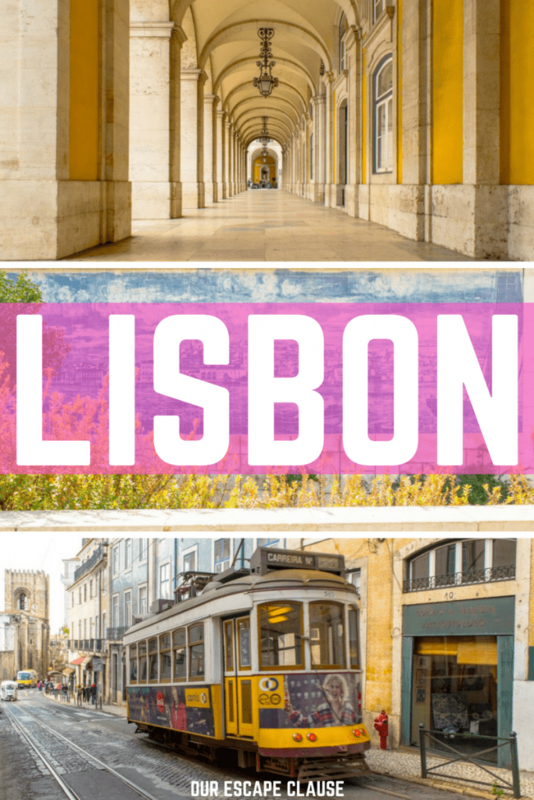 Did we check off all the things to do in Lisbon during our first visit? Not by a long shot. Just off the top of my head, we still need to see the pink street of Lisbon, visit the Belem Tower up close, check out the National Tile Museum, and visit St. George’s Castle, among many others. We also still have so much to do in the country overall, like seeing the beaches in Lagos and the charming city of Porto, just to start (maybe a Portugal road trip is in order?). But that’s okay–there’s always our next trip to Portugal. 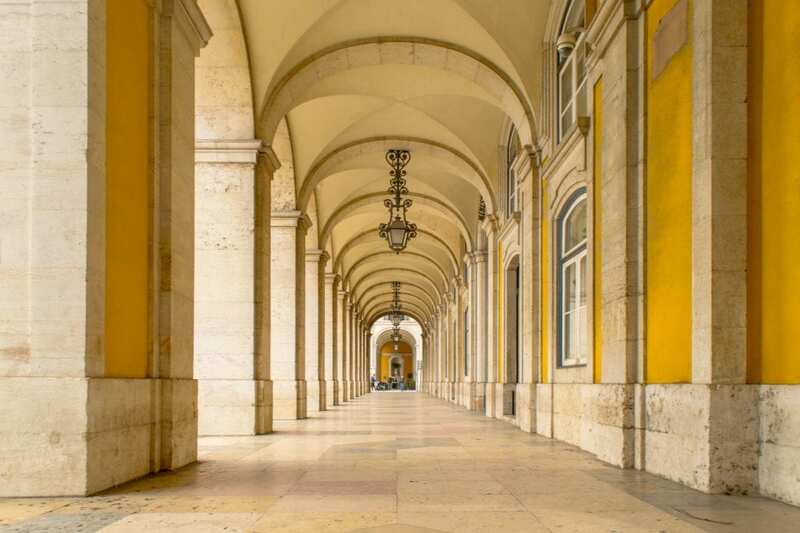 Don’t visit Lisbon without travel insurance! Pensao Elegante — We had a great experience at Pensao Elegante–the room was clean and cozy, the location solid–but the bathroom situation was the strangest we have encountered! Our room had a sink and shower in the room itself (not private, so not ideal for friends or family traveling together), but the toilet was outside the room and shared. We didn’t mind, and knew we had signed up for a shared bathroom, but the layout was definitely memorable! We would be happy to consider staying here again on a return trip–but there are also plenty of other amazing places to stay in Lisbon, from Lisbon’s many party hostels to its incredible luxury properties! Many thanks to Marlin Tour and Taste of Lisboa for hosting us on our experiences with them! All opinions are, as always, our own. I’m looking into going to Lisbon soon. Your pictures are amazing and make me want to go even more! Lisbon sounds like the sort of city I’d love – the old streets, book shops and pastries are just my cup of tea! Must make my way to this city in the near future! It definitely has plenty of those! Lisbon has been on my list for soo long now, hope I’ll finally make it this summer! Will pin and save this for when I’m planning my trip, beautiful photos! I’m heading to Lisbon in October so this is great timing. I love those Natas and the idea of the old town. Will definitely have to check out the sunset tours. Definitely recommend the sunset boat tour! It was SO much fun. I don’t know what I would love more about Lisbon, the food or all of the amazing colors of the city. The natas look amazing and I can only imagine how all of the colors blend and pop during a sunset tour. I can’t wait to go to Lisbon and experience this all for myself. Love your streetcar photography. Thanks, guys! The streetcars are super photogenic lol. Although you didnt get to see everything you got to see a lot for being four days. I have never been to Lisbon. In the matter of fact, I havent been anywhere in Portugal. Lisbons is a city I would love to visit very soon! We definitely tried to make the rounds! It’s always nice knowing there’s still plenty to do when we go back, though. I had those “natas” before, not in Portugal though. They were really popular in Macau before. I loved the architectures there – just so beautiful and colorful. Hope to visit soon! Interesting! I think I’d love to visit Macau after seeing Portugal and see how many similarities remain. Lisbon! It is under three hours from London but we still haven’t managed to visit it. I love how colourful and lively the city looks. And I have heard that it has lots of antique shops and weekly flea markets. Would love to visit those. Yes! We didn’t get a chance to hit up any of the markets, but I have heard good things as well. Sintra was definitely incredible–even more memorable than we expected. I would love to try Nata. It looks really delicious. I am glad that your trip was seamless. Will definitely consider your tours company. I have never even heard of Sintra! Would love to go there one of these days, that castle was absolutely stunning. I really am drawn to things with vibrant colors and unique architecture. Sintra is amazing! Definitely worth the trip if you make it to Lisbon–it was definitely one of the highlights of our time in Portugal. Lisbon has been on my list forever. And, your posted added more fuel to my wanderlust desire. Like you, I too would crazy after pastel de natas. They look so delicious. Architecture, bookstores, unique streetscapes are definitely a big plus for me. Aw, thanks Archana! Hope you make it soon–sounds like the perfect city for you! I was just deciding between Portugal and Prague, and did a google search and your site came up. Your tour of Lisbon and the pics have helped me choose Portugal. It’s always been on my list but other destinations always seem to take priority. However, this year, all I could think about has been Lisbon, so I am happy to finally make the decision to go. Great blog – very resourceful. We’ve been the same with Portugal–it has always been on the list but we had a hard time actually finding the right time to go. So glad we could help you choose–I think you’ll have an amazing time in Lisbon! sorry, but “green wine” is not “young wine”! its a normal white wine, made in a particular region (Minho and douro litoral) and with some specific types of grapes! Hmm, interesting clarification. I did a bit more research after your comment and it seems that while green wine designation is technically only based on the region, it is overwhelmingly considered to be referring to young wine (which is probably why our tour guide taught us as such). Interestingly, one of the only articles I found (in English, anyway) that spoke to how green wine doesn’t need to be young also said it doesn’t need to be white!